These poems are from the Kahlil Gibran's The Prophet. These love poems were a gift from the man who sexually assaulted me as a part of the grooming process. 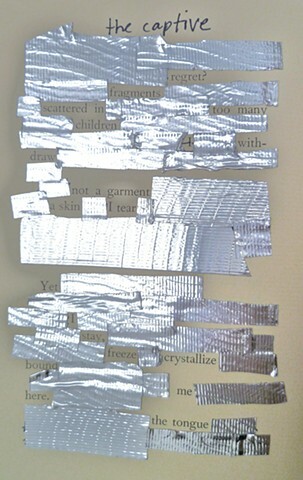 They are redacted to reveal a hidden, more predatory meaning with silver duct tape. This material is a familiar Midwestern fix-all material which for me evokes masculinity, temporary repair and even a crime scene, while the silvery glossiness reminds me of that space suit the archetypal astronaut wears. The ambivalence interests me between the sugar coated delivery of the love poem and the sinister subversive reshaping of the victims brain via hidden propaganda and the silently received messages during manipulation.